Electricity pylons, road-signs and rusty advertising plaques steal the spotlight from the Giza pyramids in these images by photographer Manuel Alvarez Diestro. 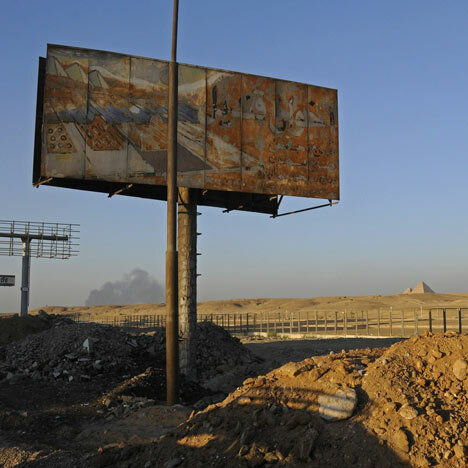 The series was shot 20 kilometres away from the towering structures, in the outskirts of Cairo. Unlike pictures promoted by Egypt's tourist industry, these photographs depict the setting of the pyramids as an abandoned industrial wasteland. Diestro previously documented growing high-rise cities in Asia for a separate photographic series - see our earlier story here. See also: more photography stories on Dezeen. This photographic series entitled “Pyramids” is a visual interpretation of Cairo’s past and present during the times of the Revolution. My stay in Cairo after many years was getting to an end and felt like tackling for once the subject of the Pyramids of Giza, but to be represented in a new context not seen before. Twenty kilometers away and after hours of walking I found and photographed what I thought to be a landscape full of symbols and strong visual juxtapositions. This place became a “perfect escape” for several days where I could disconnect from the social unrest and the violence I was experiencing in the city. I walked along cars and military trucks and looking perplexed to an epic view. The pyramids were in the far distance and confronted with traffic signs, semi abandoned advertisement panels and electric posts that I was encountering on my way. However, in the outskirts of Cairo this “collage” of symbols seems to suggest an uncertain future.